I love the gorgeous design papers and the fabulous image on this beautiful card. Brilliant. Hi Sylvie... what a lovely card just love your pretty colours. What is it about these little stamps that we love so much???? Gorgeous card Sylvie, love the fab image and beautiful flower. Oh what an adorable card Sylvie. what fab cards love them all. How cute is this?! I particularly like the little doily flower and the matching border. 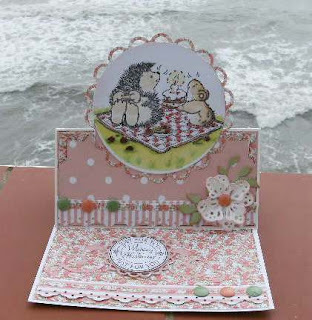 Gorgeous card for this weeks challenge at penny Black, thanks for joining in. but that sea in the background looks a bit rough.